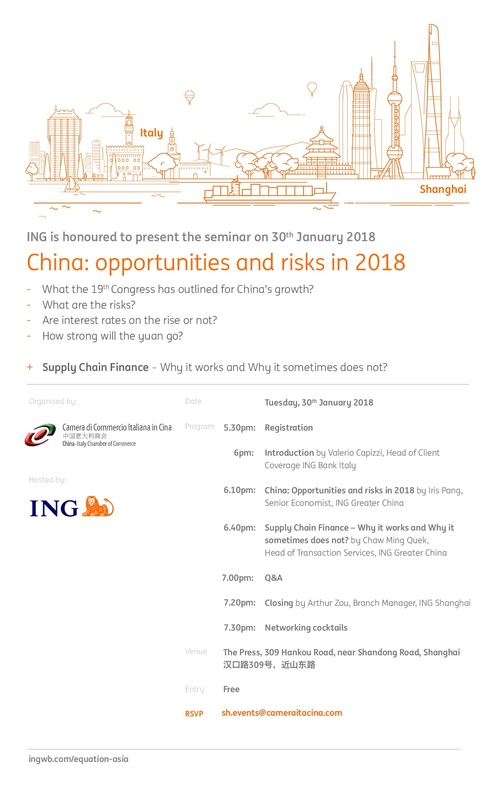 The China Italy Chamber of Commerce is glad to present “China: opportunities and risk in 2018”, a seminar hosted by ING Bank that will take place on January 30th in Shanghai. The 19th National Congress held in October 2017 has been a turning point for China, as well as for the international business relations. High-ranking conference speakers, including Valerio Capizzi, Iris Pang, Chaw Ming Quek and Arthur Zou both of them from different branches of ING Bank, will give different insight about business and political environment in China and the potential risk and opportunities. The entrance at the event is free of charge and open to our Members and Non-Members. At the end of the seminar, a networking cocktails will be offered by ING Bank. We kindly invite you all to attend the event! Info and reservations: please write at sh.events@cameraitacina.com or click here to register your seat!